It seems that the extremist Islamic groups, after emptying the areas under their control of journalists, doctors, or any similar cases that would be considered specific abduction targets and asking for a ransom, usually cash, have turned their attention to targeting and abducting members of the local Syrian community and asking for substantial ransom sums since they managed to take over wide areas of Idlib governorate in July 2017. While Hay’at Tahrir al Sham doesn’t often declare responsibility for such incidents, these abductions take placer in areas held by them, not to mention that they have never conducted any serious operations to track and hold the abductors accountable. Detaining a civilian or a fighter and threatening to kill or hurt then unless a specific act is completed or avoided constitutes an act of taking a hostage. This criminal act’s impact is not limited to the detained individual or even his family, but extends to create a sense of terror and panic within the entire community. The international humanitarian act was very explicit and strict in declaring taking hostages a war crime, as well as Security Council Resolution 1566, adopted in October 2004, Common Article 3 of the Geneva Conventions, and the statute of the Nuremburg Trials and the International Criminal Court (as per Articles 8-2-a-iii and 8-2-c-iii of the Statue of the International Criminal Court). On Tuesday, April 24, 2018, around 01:30, about 16 gunmen we suspect that they are associated with Hay’at Tahrir al Sham (al Nussra Front) stormed a house in Sarmada city, northern suburbs of Idlib governorate. The gunmen took Saeed Naqresh to an undisclosed location. 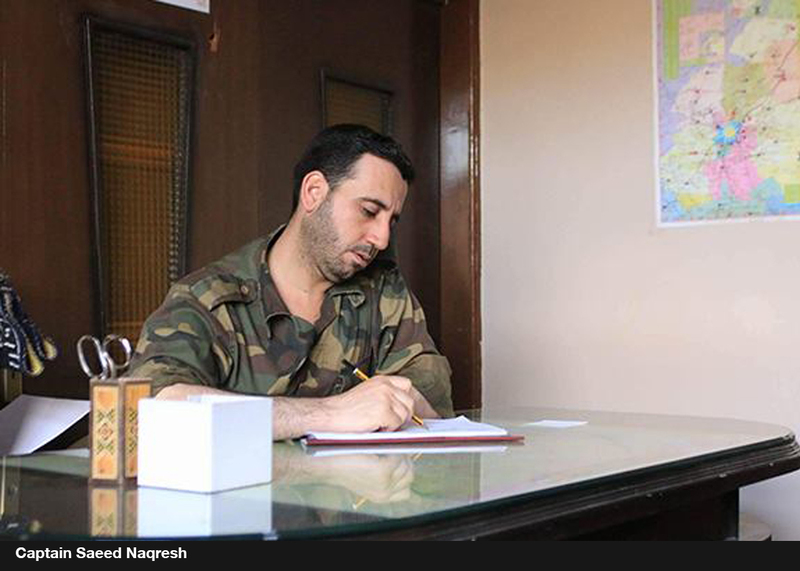 Captain Saeed Naqresh is from al Dmair city, Damascus suburbs governorate, he defected from Syrian regime forces in 2012 and is considered a prominent leadership figure with an armed opposition faction who used to operate in Darayya city, Damascus suburbs where he led Lewa Shuhada al Islam before chairing the political office for the same faction after they had to leave Darayya city to Idlib city in August 2016. He was involved in a number of rounds of the Astana talks.